An important part of the decoration of a children's party, are the centerpieces, these are not only used to decorate the head table and the guests, but they are placed on the treats and snacks you want to share with your guests. 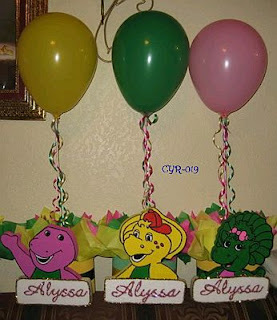 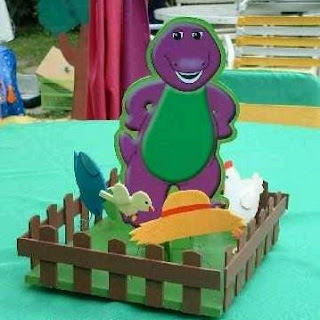 Here are some interesting centerpieces of Barney and Friends. 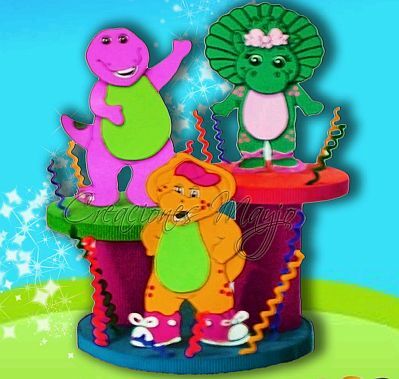 Centerpiece of two levels, each of them have characters animated series Barney & Friends, pacifiers are embedded on each floor. Another option is the use of metallic balloons, placed on a base decorated with colored paper. 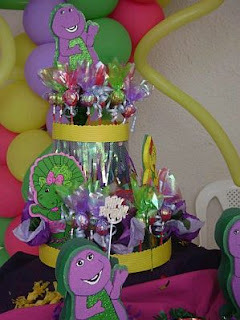 Another cute centerpiece with Barney and his friends, at the bottom placed the candy and on top looks good the birthday number or the birthday girl. 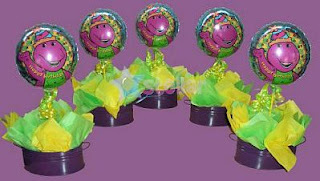 Simple and beautiful at once, this is a centerpiece with Barney, decorated with two balloons in the back. 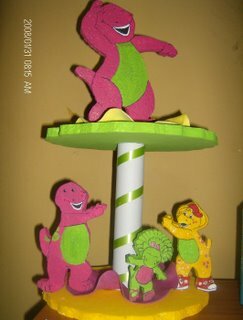 Center table in the first two levels Barney and his friends playing and in the second a large image of Barney. And if you chose Barney farmer, this centerpiece could be useful. 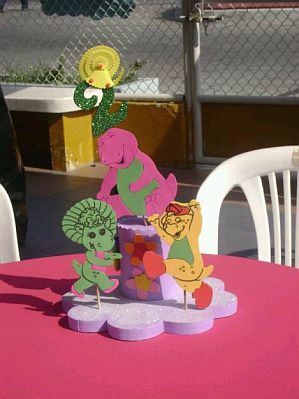 The centerpieces can be decorated in different ways to give them life, in this case the figures of Barney and his friends are complemented by the use of pipe cleaners. 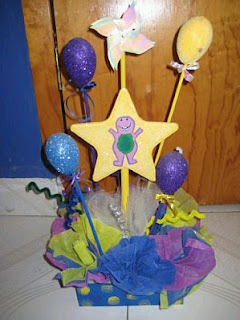 Centerpiece of a level, the base is decorated with colored paper, in the middle there is a star with the image of Barney and balloons on top. 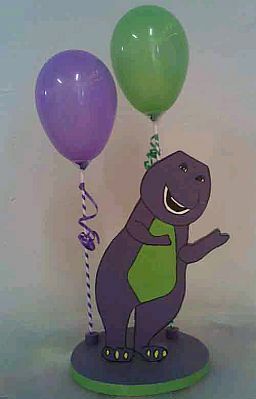 And if you like the idea of ​​using balloons, here's another proposal, this is at the top and bottom faces of Barney and Friends. Finally, it is also fine to use centerpieces with Barney's image in different positions.